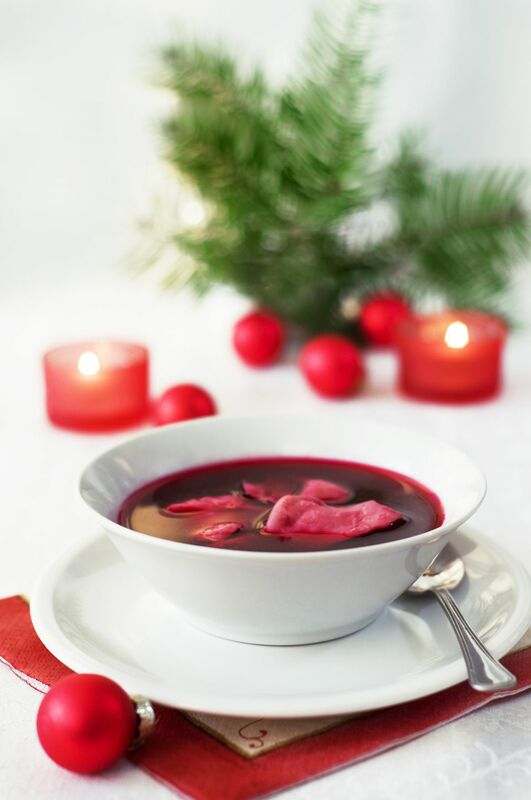 This recipe for Polish Christmas Eve beet soup (barszcz wigilijny) is from chef Marek (Mark) Widomski, founder and director of the Culinary Institute in Crakow, Poland. While many beet soup recipes call for beef stock, meat or bones, since this is a Polish Christmas Eve supper (wigilia) recipe, it must be meatless. The soup is made with a beet sour (kwas) that must ferment for at least three days before using and vegetable stock. The traditional way to eat barszcz wigilijny is with mushroom uszka or paszteciki. At the Culinary Institute in Crakow, Chef Mark and his staff offer classes in everything from peasant food to gourmet cuisine, tailoring them to the individual's needs, in Polish, English and other languages. Place 3 1/2 pounds prepared beets in a large crock or ceramic bowl. Cover with pre-boiled, lukewarm water. Add 1 slice rye bread with the crust, pushing it under the water. Cover the crock or bowl with cheesecloth and let stand at room temperature for three days. Then strain through cheesecloth, pour into a glass jar and seal it. Store in the fridge. You may eat the strained beets or discard them. Place 1 pound peeled and sliced beets, 1/2 pound sliced Polish soup vegetables (włoszczna) like carrot, parsnip, celery root, and leek, in a large stockpot. Add 6 cups cold water and 1 teaspoon butter. Bring to a boil, reduce heat and simmer until vegetables are tender. Strain, pressing on vegetables to extract every last ounce of goodness. Return the strained liquid to the pot and add 1 clove garlic mashed with a little salt, 2 cups of the beet sour (kwas), 1/4 cup strained mushroom soaking liquid, salt and pepper, and sugar to taste. Bring to a boil, reduce heat and simmer 30 minutes. Before serving, stir in remaining 1 teaspoon butter and 1 tablespoon chopped parsley. Ladle into hot bowls and serve with mushroom uszka.